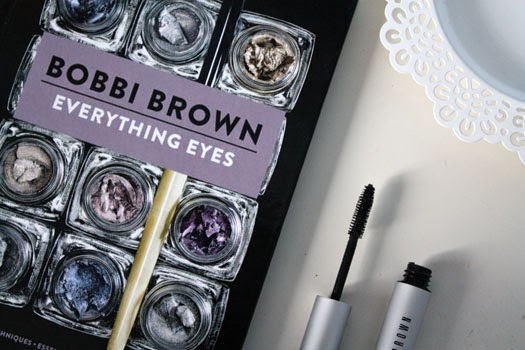 Bobbi Brown Everything Eyes-This tome may not be as hefty in size but as the name would suggest, it covers everything you'd ever want to know about eyes. There's a guide to essential brushes, a rundown on eye products and their expiry dates, eye makeup looks to perfect and more. There was also a chart suggesting eyeshadow colours that complement particular eye colours which I found a bit iffy. When it comes to things like that I suggest you experiment yourself and figure out what you like and what works best for you. There's also a really useful section on eye makeup if you're a glasses-wearer too. All in all this is a great book to have handy if you love eye makeup. Bobbi Brown Smokey Eye Mascara*-Kate of Nouvelle Daily often raves about this mascara so I was looking forward to trying it out. It's basically been the only mascara I have been using all month.The Smokey Eye mascara builds volume gradually rather than in one sweep. You're left with lengthened, fuller lashes without the clumps. It layers well and leaves you with such full and fluttery lashes. I really love the effect it gives. I also love that it has a proper brush rather than a plastic bristled one. Lots of people favour the latter but I personally don't think they're always as effective. This mascara is pretty longwearing too. I'll definitely be repurchasing this once it runs out. *Have you tried any of Bobbi Brown's eye products?